Welcome to another edition of Boxing’s Devil’s Advocate. Today we examine the case of Saul “Canelo” Alvarez vs Genady “GGG” Golovkin, and consider the reasons why there really should be no rush to stage this contest. Firstly, I acknowledge that Golden Boy productions, promoter of Saul Alvarez, and K2 productions, promoter of GGG, have a tacit agreement in place to have their respective fighters face off in the fall. That, however, was originally based on a WBC mandatory, a blatant cash grab from a notoriously corrupt sanctioning body who threatened to strip Alvarez of a title he really shouldn’t have, should he not face GGG. After all, the WBC middleweight title has recently changed hands twice in fights that were not even contested at middleweight. This brings me to the crux of my argument; the main reason Canelo vs GGG can wait is because Saul Alvarez is not yet a middleweight. I say this fully realizing that Alvarez walks around at upwards of 180 pounds. Ricky Hatton used to walk around at 180 lbs, and he was at his best at Jr. Welterweight. All that matters is where Canelo tips the scales at the weigh in, and he has not yet fought a single fight that was contested at the middleweight limit. Sacrificing him to Genady Golovkin at this point in his career is meaningless. In Saturday night’s PPV main event, Canelo looked strong, rallying from a slow start to walk down and eventually stop Amir Khan in what is sure to be a strong contender for knockout of the year. He was clearly the bigger man in the ring, and Khan’s combinations, while blisteringly fast and often accurate, bounced off Alvarez and did little to deter the cinnamon man. We have no idea how Canelo might have fared were he facing similar punches from a middleweight, because we have never seen him face one. Dominating a blown up welterweight who has been knocked cold by Jr Welters is no indication of your ability to take a middleweight punch. Last night was a fun spectacle. Alvarez had a chance to add a marquee name to his record while treating his fans to fistic fireworks, all on Cinco de Mayo weekend. But in the end it was little more than an exhibition, and while the WBC may have sanctioned it for their middleweight belt, that didn’t make it a middleweight fight. That leads me to my next point; Saul Alvarez is not the lineal middleweight champion. I know that Lamps, Max and Roy kept saying that the lineal middleweight title was on the line Saturday night, but I don’t believe it was. The lineal middleweight title cannot change hands in anything other than a middleweight fight. Khanelo was contested at a limit of 155 pounds. The middleweight limit is 160 pounds. A fight which is contested at 155 pounds is a catch weight fight. While it is true that a fighter can go into a middleweight fight weighing less than 160 lbs, it is the weight limit, not the weight of the fighters, which determines the weight class of a contest. When Miguel Cotto faced Sergio Martinez at a catch weight of 159 pounds, he may have won the WBC middleweight title, but technically the lineal title should not have changed hands since it was not truly a middleweight fight. Just as Kelly Pavlik remained the lineal middleweight champion despite being bested by Bernard Hopkins at a catch weight, Martinez actually remained the lineal middleweight champion despite his loss to Cotto at a catch weight. The middleweight lineage, which was re-established when Hopkins garnered all the belts in the early 2000s, was broken when Sergio Martinez retired. So when Alvarez defeated Cotto (also at a catch weight) there was no lineal title up for grabs. So if Canelo is not the lineal middleweight champion, or even a real middleweight for that matter, why the push to see him face GGG? That is the easiest question of all to answer. Fans want to see Alvarez face GGG for the same reason they wanted to see GGG face Andre Ward, or Mayweather fight GGG. They want to see the smaller fighter get beaten. Think about it, who is calling the loudest for Canelo vs GGG? Is it the Alvarez fans? No, it’s the Golovkin fans. Just as the Ward fans called for a GGG vs Ward fight, and many GGG fans bewilderingly accused Mayweather of “ducking” GGG. How can you duck a fighter who isn’t even in your weight class? I understanding wanting to see fighters challenge themselves, and we all want to see the best fight the best. But the only real reason that anyone would want to see Canelo vs GGG before Alvarez has even faced a single middleweight is because they want to see him on the receiving end of the kind of fustication that he imparted upon Amir Khan. Certainly Khan’s trainer Virgil Hunter does, based on his post-fight rant. I can be as bloodthirsty a ghoul as the next boxing fan, but demanding a fight that we know is going to be a one sided beat down holds little appeal for me. Beating Alvarez does no more for GGG’s credibility at middleweight than beating Amir Khan did for Canelo’s. 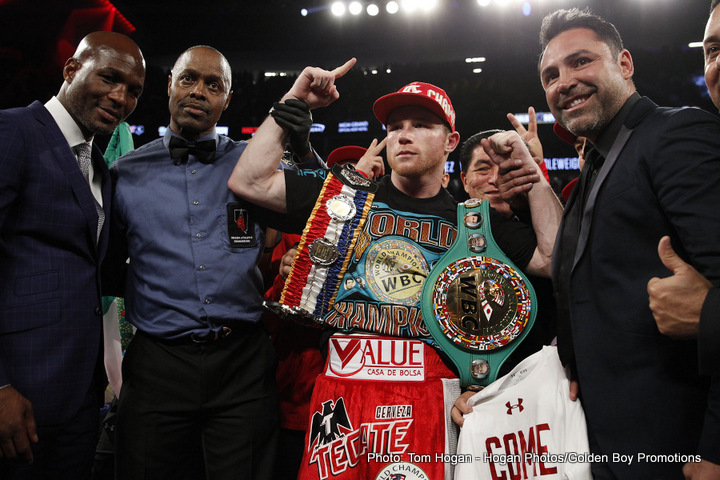 Let Canelo prove himself at middleweight first. Let’s see how Alvarez deals with punchers like David Lemieux or Curtis Stevens before we consider putting him in with the monster of the middleweight division. A few fights at the middleweight limit, to see if he can handle the division, would go a long way to adding legitimacy to what could be built into the most lucrative fight in the sport. Speaking of lucrative fights, did you see Oscar’s face following the KO? If his smile was any wider they would not have been able to fit it on camera. He managed to put on what may turn out to be that biggest PPV event of the year while only having to guarantee the main event contestants a reported $5.5M combined. Contrast that with Pacquiao vs Bradley, where Bob Arum had to pay his fighters a combined $26M for an event which didn’t do near the business Canelo vs Khan is expected to do. If you seriously think that Golden Boy Productions is going to risk their cash cow in a fight with GGG before he is 100% ready, you are most assuredly mistaken. Nor should they. Despite the pressure from fans and media, Canelo should take his time and continue to build his brand as he builds himself into a true middleweight. There really is no reason to rush; the interest in this fight is there, and like Alvarez himself, it will get bigger with time.